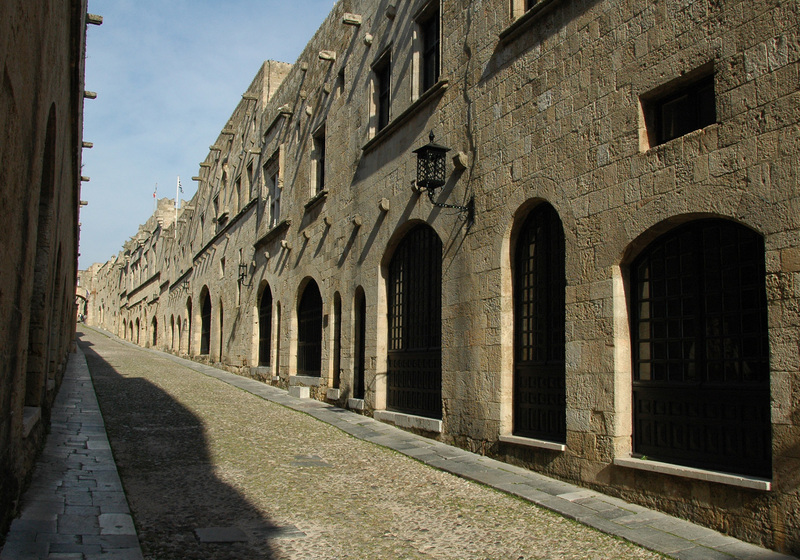 Street of the Knights (Odós Ípoton of ιππος, horse) is still the main artery of the medieval city , which is the street, then called "Grand Street Chasteau" qu’empruntaient Knights going to Palace of the Grand Masters the same pattern as that of the old road, which was found many vestiges qu’empruntaient once the Greeks from ancient Greece to go to the Acropolis. 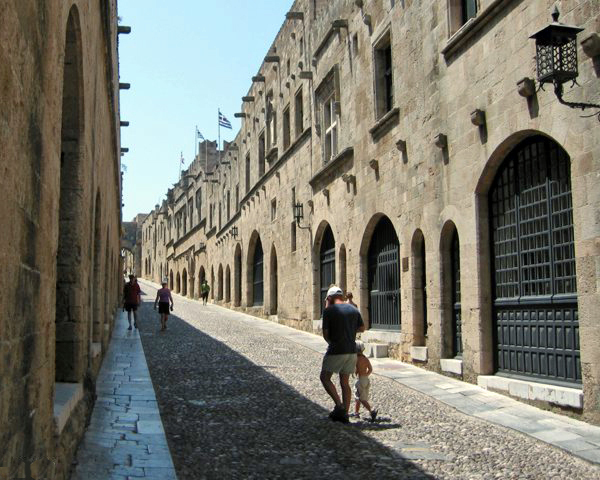 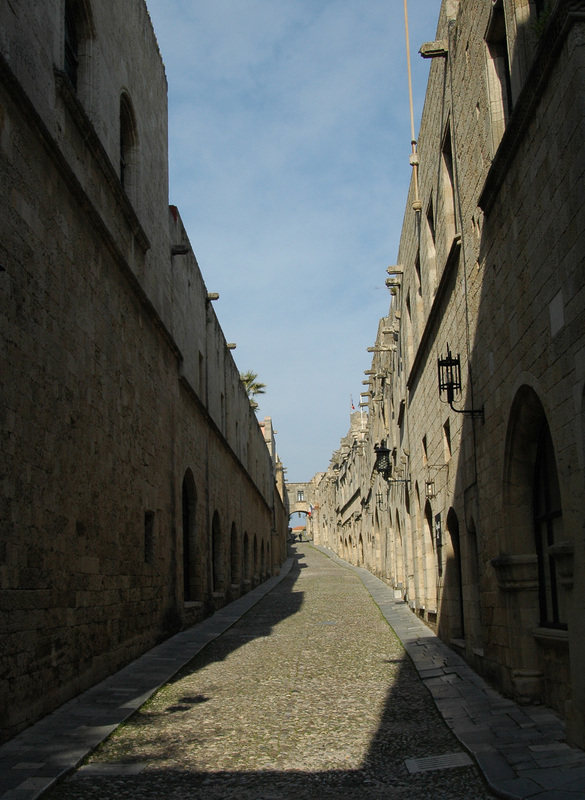 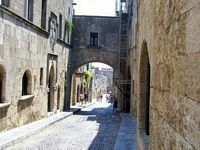 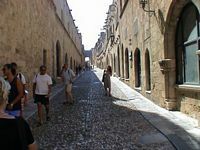 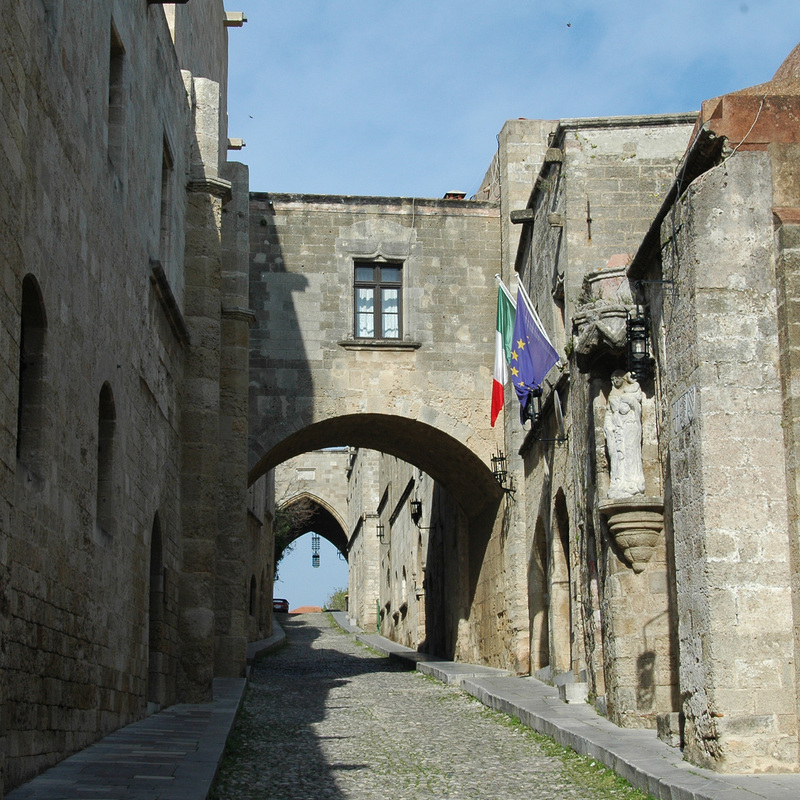 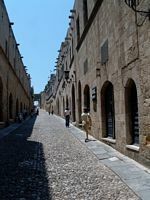 The street is 200 m long and 6 m wide, straight, narrow and slightly uphill, the most beautiful medieval street of Rhodes , cobbled into "cat’s tongue". 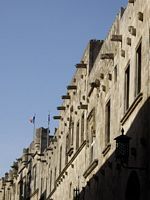 Knights Street is lined with ’inns’ (palatial residences) of different nationalities Knights. 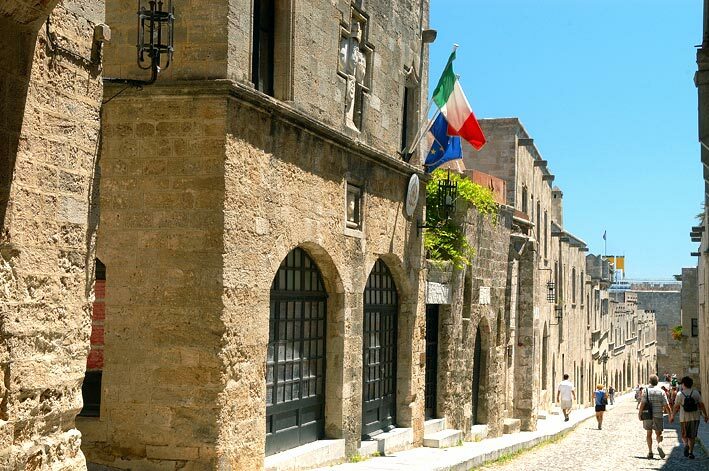 Seven Nations and Languages ​​( Auvergne , Provence , France , Aragon , Germany, England , Italy ) who made ​​the Knights of St. John in the twelfth century, there remain only four hostels, those of Italy, France, Provence and Spain. 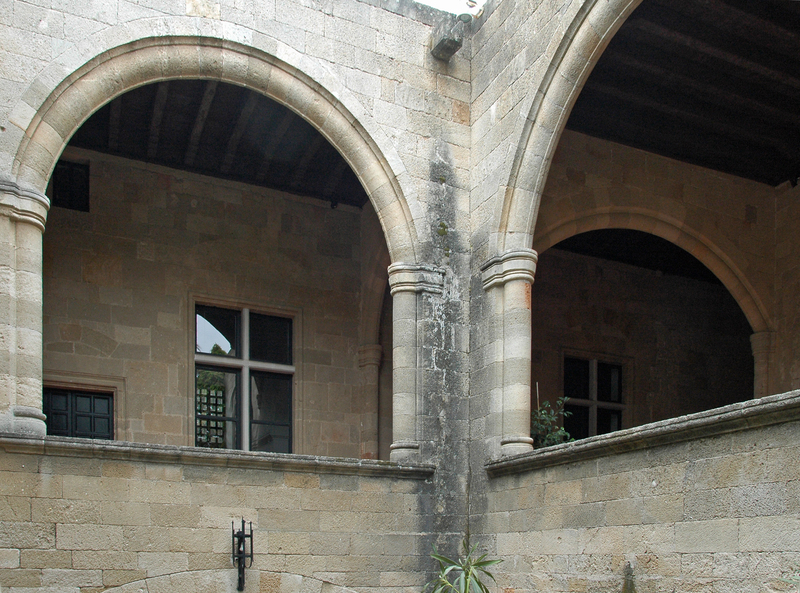 The Inn of the language of Auvergne is located away from the street of the Knights. 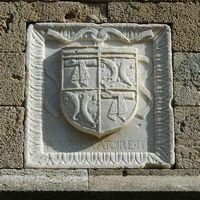 Each of the hostels is adorned with a crest representing his nation. 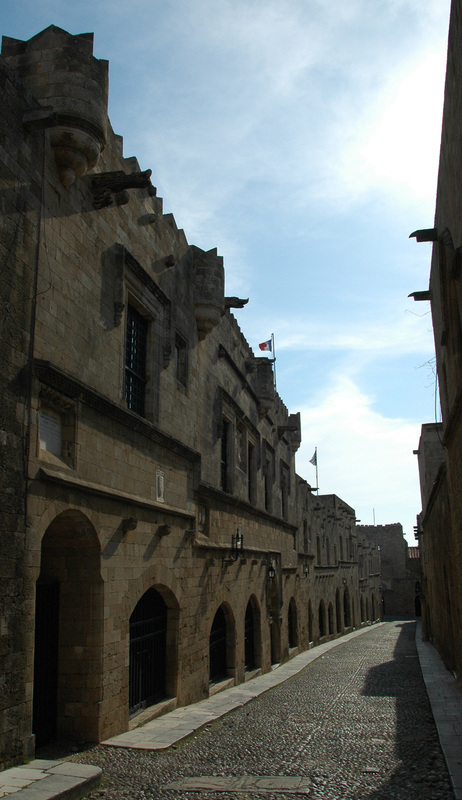 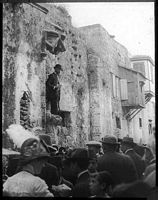 The knights and their followers lived in this part of the fortified city on all four sides, the Citadel, called Collachium : the inner wall, now defunct, was parallel to the street Socrates . 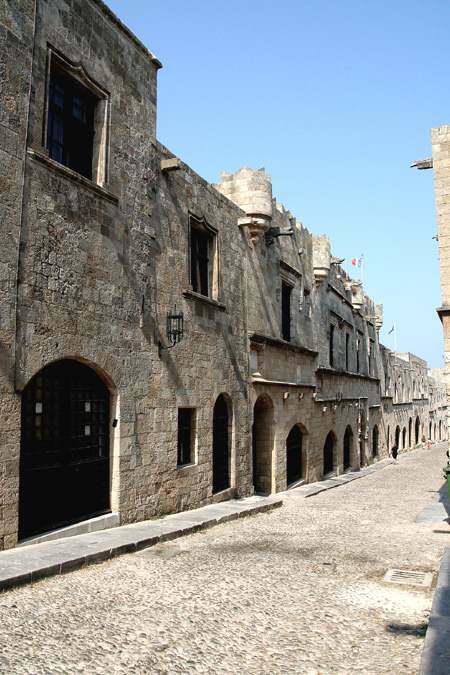 In the middle of the eastern Mediterranean, the buildings on this street have a pure Gothic architectural unity of the fourteenth century, fifteenth and sixteenth century, and belong mostly to the second period architectural knights, later the seat of the Turks in 1480. 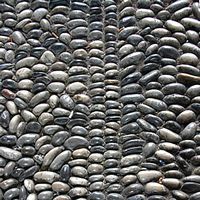 They are constructed with blocks of porous rock local regularly arranged. 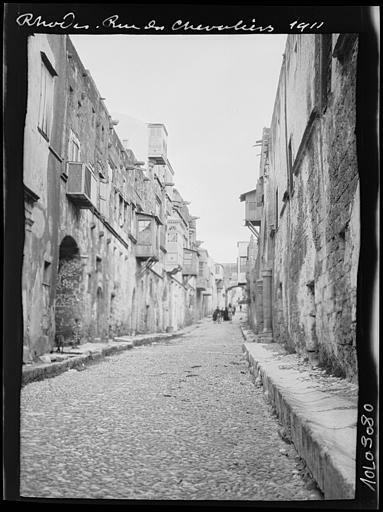 Knights Street has an appearance very different from the ways of the Old City . This is due to the renovation carried out by the Italians in 1916, they destroyed all the wooden Ottoman balconies to give back to the street style of the fifteenth century, the Knights. 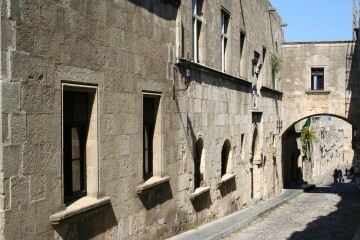 Knights Street begins the old hospital , the Catholic cathedral and the inn of the language of Auvergne . 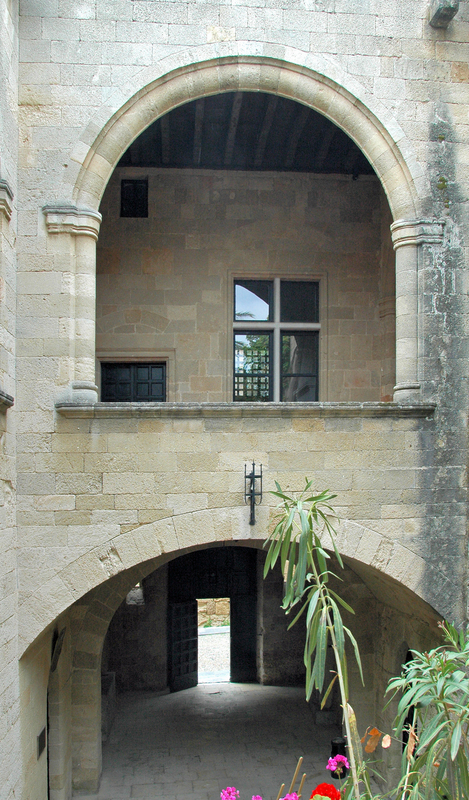 Always right amount, after a small building with arched windows stands the Inn of the Language of France (Katalima Gallias). 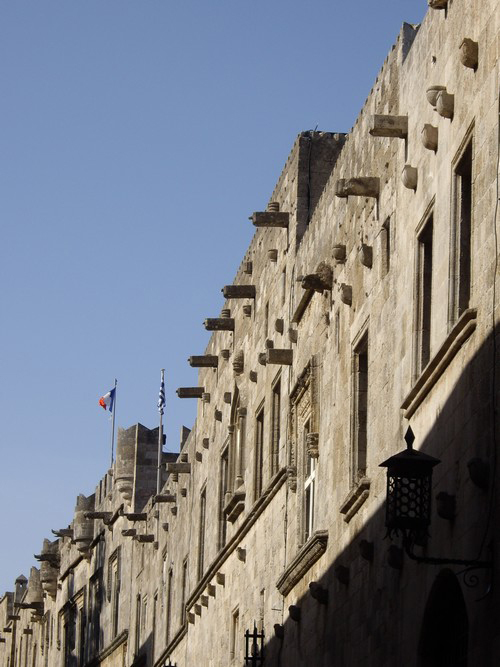 The Inn of France is the largest and most beautiful of all hostels: because the French Knights werepredominant, the building was more richly decorated than others. 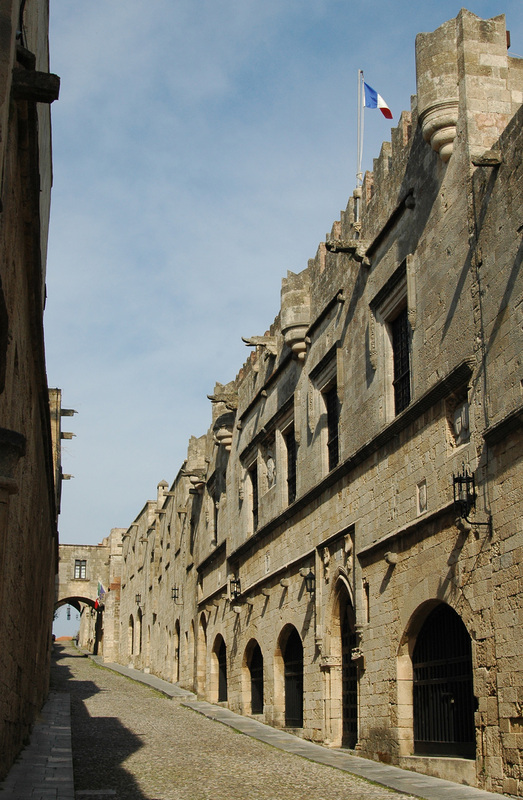 The Inn was restored around 1492, after the siege of 1480 when it was almost destroyed. 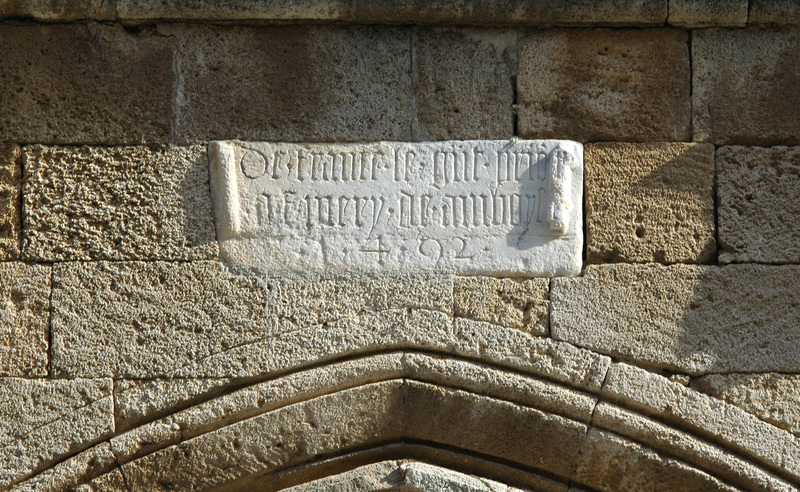 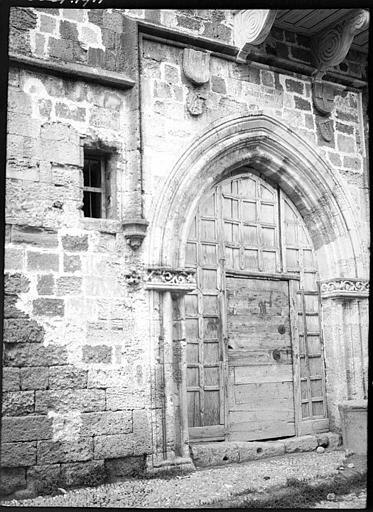 His third point door is surmounted by an inscription dated 1492 and dedicated to Emery d’Amboise then Grand Prior of France and future Grand Master of the Order from 1503 to 1512. 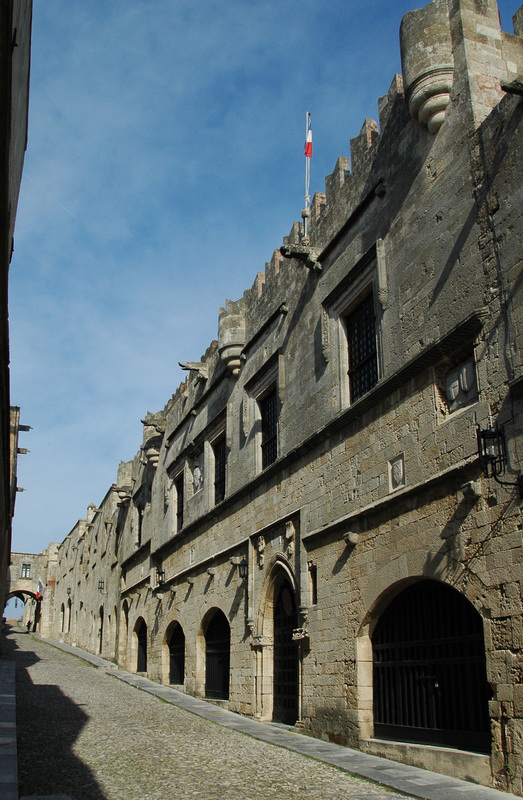 The story goes that the Grand Master Dieudonné de Gozon killed a crocodile escaped from a ship (probably Egyptian) who landed at Rhodes , and terrified the inhabitants of the island. 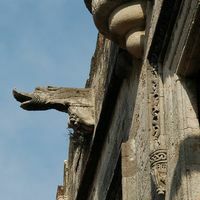 Gargoyles on the roof representing the animal adorn the edges of the roof to commemorate this event. 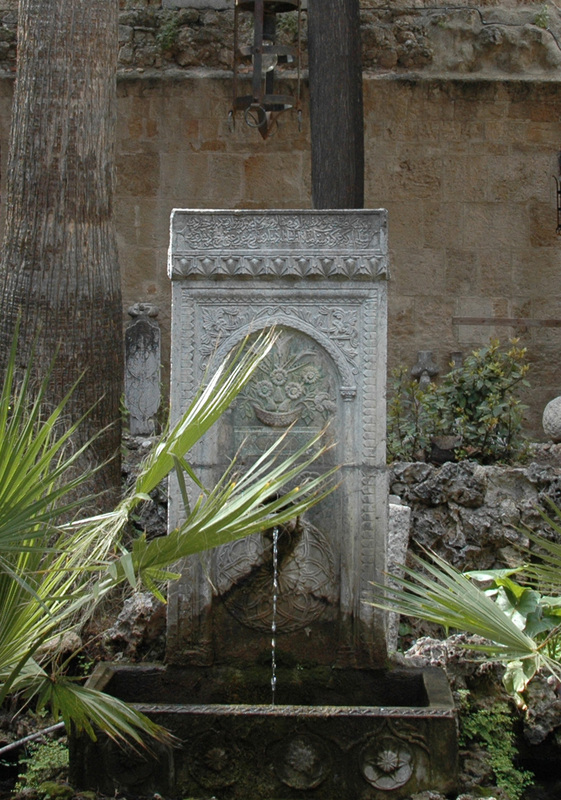 "The lilies of France, as fresh as if they came from the hand of the sculptor." 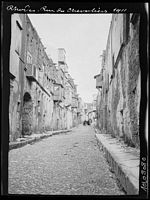 "The most beautiful houses on the right, amount: many patches, square windows separated into four ogival door (...) The general tone of the street is gray, it is sadder than beautiful." 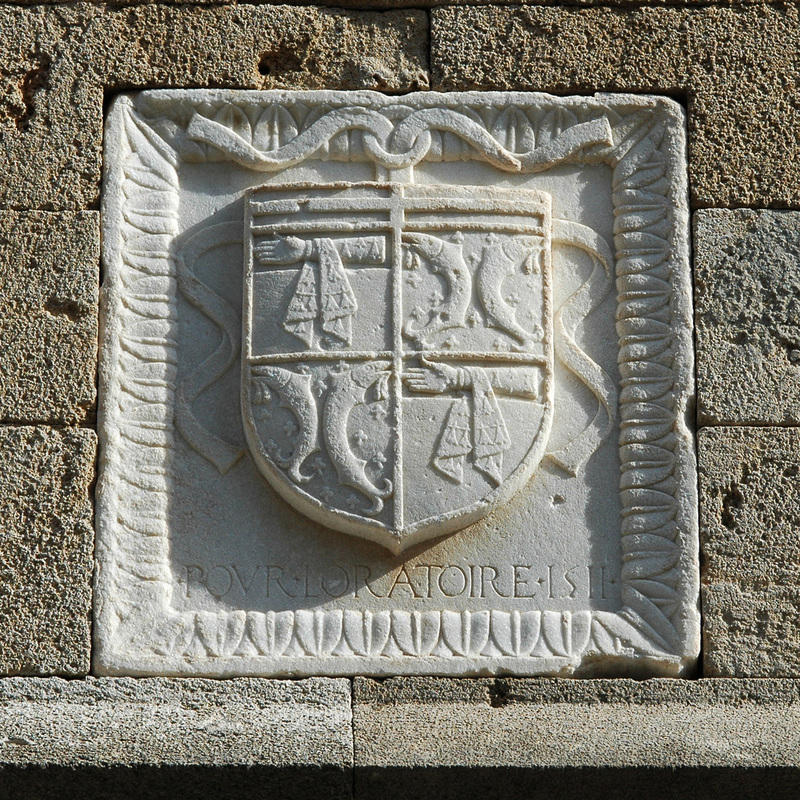 Philippe Villiers de l’Isle Adam , the hero of the siege of 1522, largely with the hostel in France, as evidenced by three plates with its coat of arms, accompanied by three different dedications "Pour la Maison", "Pour l’Oratoire "" Pour Philerme. " 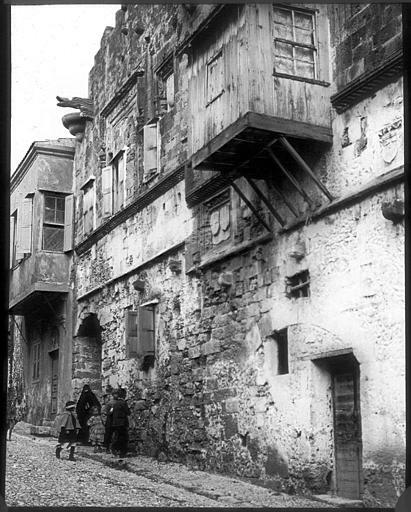 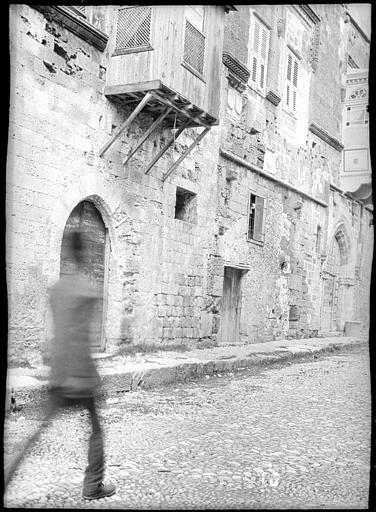 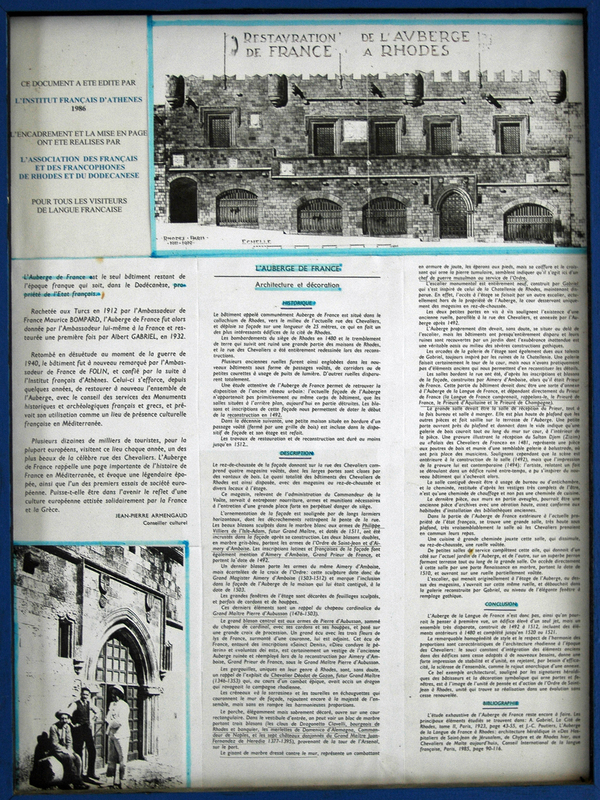 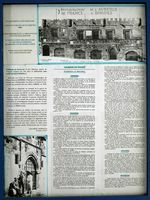 The oldest inn in France was bought in 1911 by France’s ambassador to Turkey, Maurice Bompard, who had restored at his own expense and donated to the state. 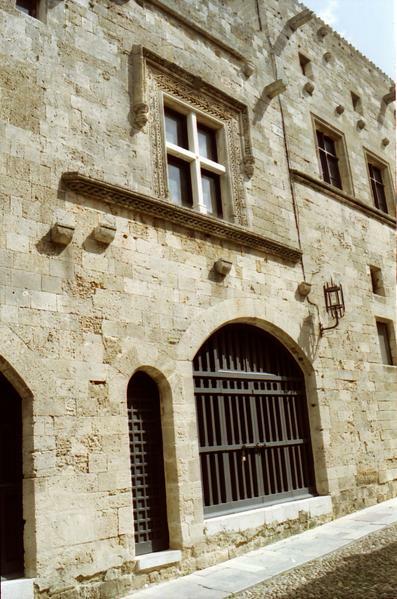 It now houses the Consulate of France. 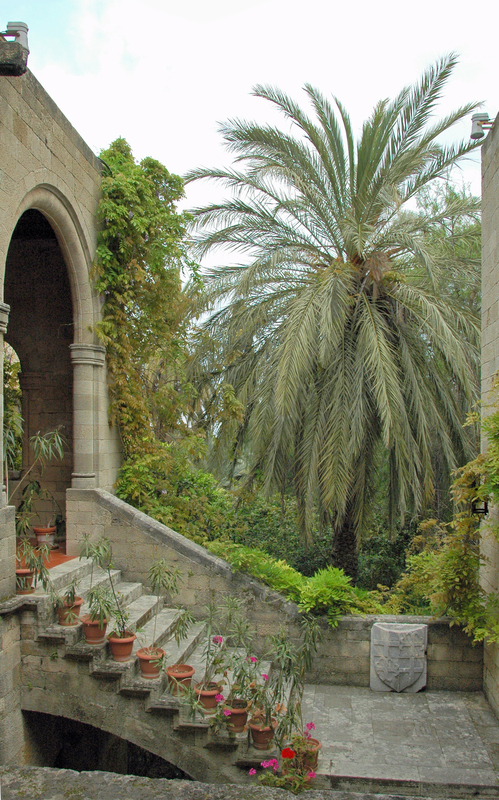 Visiting the gardens and exhibitions on the 1st floor is possible from 8 am to noon. 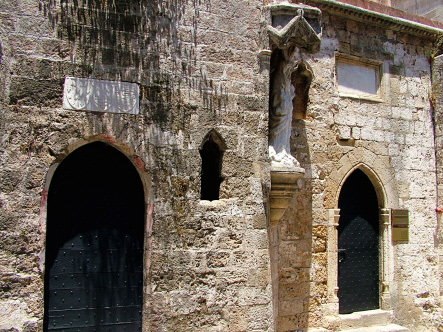 Beside the Inn of France is the chapel of France, Church of the Holy Trinity (Agia Triada). 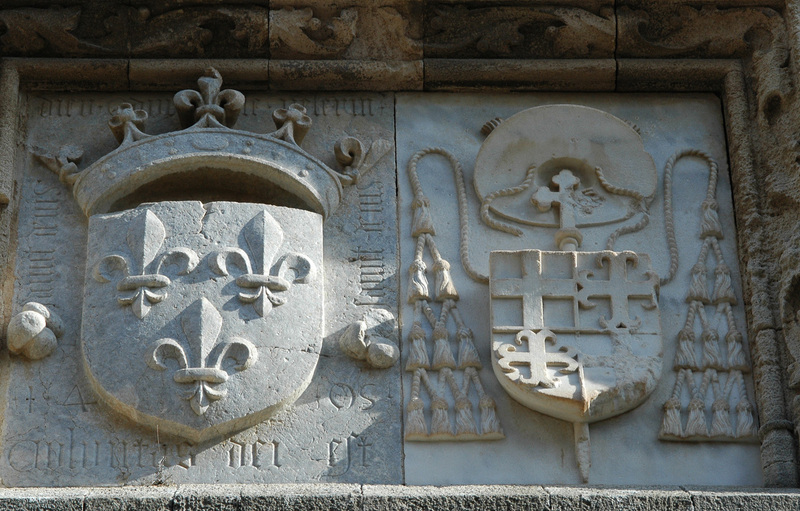 Among the badges adorning the facade, are those of the pope, England and Grand Master Raymond Bérenger (1365 -1374). 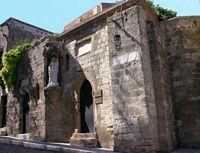 The Church of the Holy Trinity is a small Gothic building of the fourteenth century / fifteenth century. The church was probably vaulted medieval times, but it has a dome today, remember his transformation into a chapel Muslim (Khan Zade Mejid) under the Ottoman occupation . 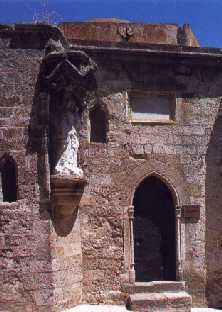 It remains in the apse frescoes few pieces of the late fifteenth - early sixteenth century. 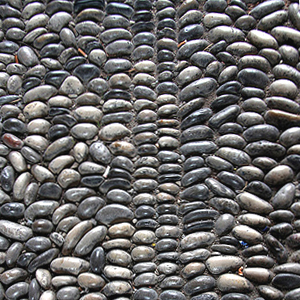 The church has a tiled floor laid by the Italians in 1930 . 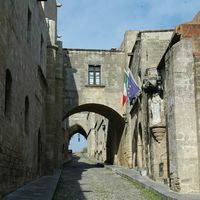 Visits from Tuesday to Sunday from 8 h 30 to 15 h. Admission is free. 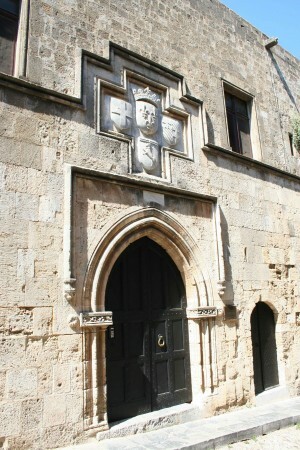 Then the house of the Chaplain of the language of France, restored in 1918 and now houses the Music Conservatory of the city. 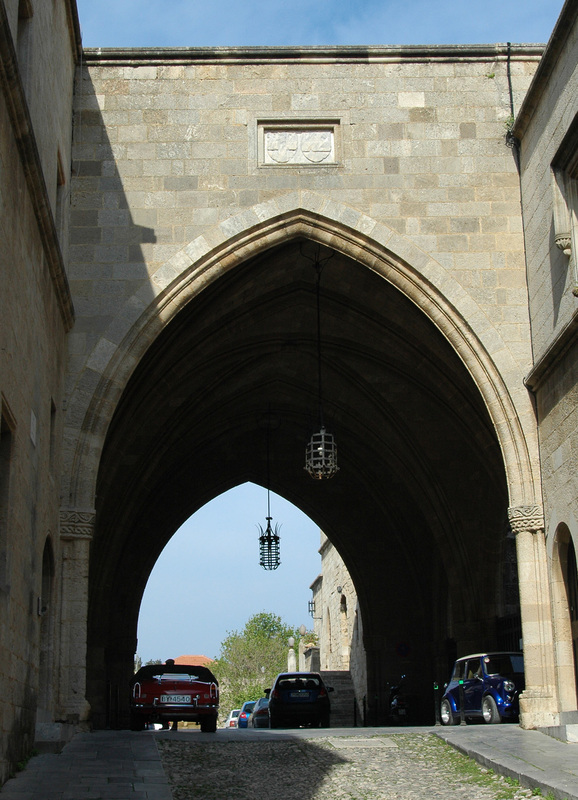 The main entrance is Gothic arch. 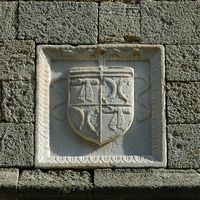 Above the entrance, the arms of the papacy are carved from a block of marble, flanked on either side of the royal arms of England (lilies on the left, lions on the right). 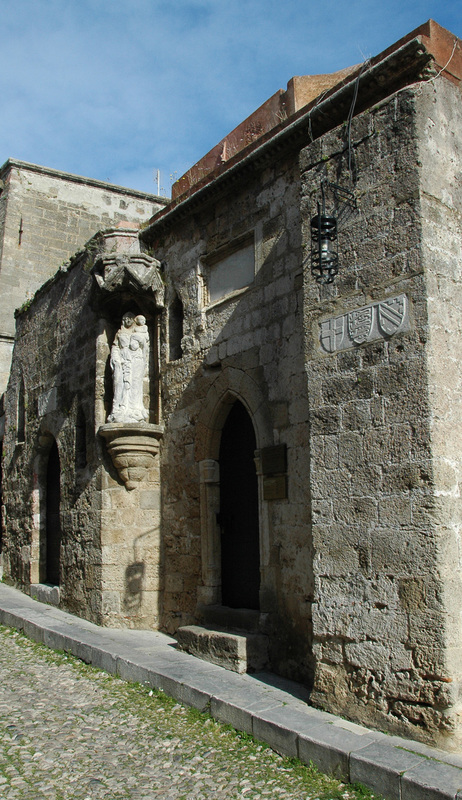 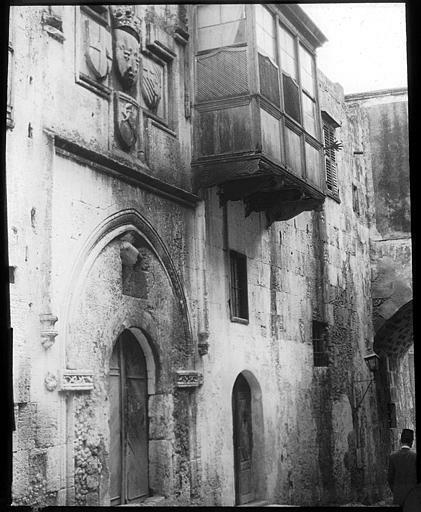 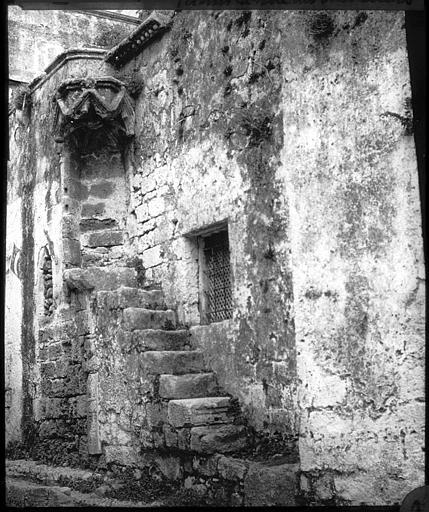 On both sides of the door are two niches at different levels, a niche houses a statue of the Virgin and Child (the statue of the twentieth century). 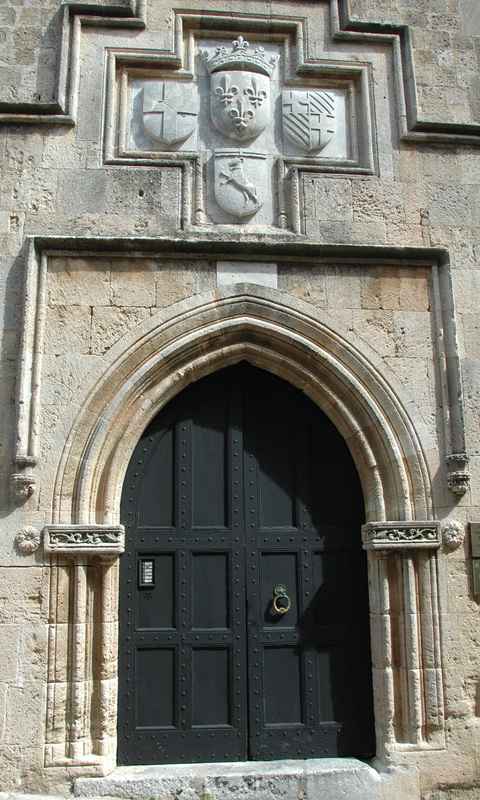 A second door, rectangular, narrow passage leads to a vent on the west side of the chapel. 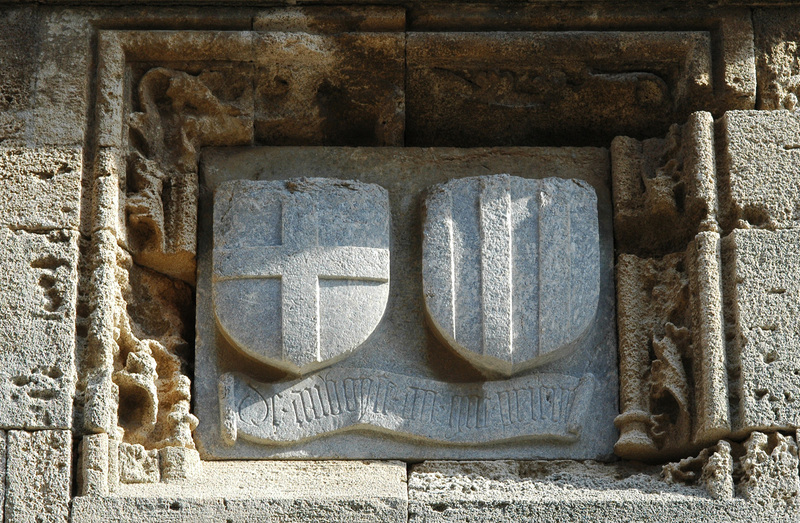 Marble lintel is decorated with ten badges (England, Helion de Villeneuve , Order of St. John, Dieudonné de Gozon , England, Peter Corneillan , Raymond Berenger , Roger de Pins and unidentified crest lion rampant. 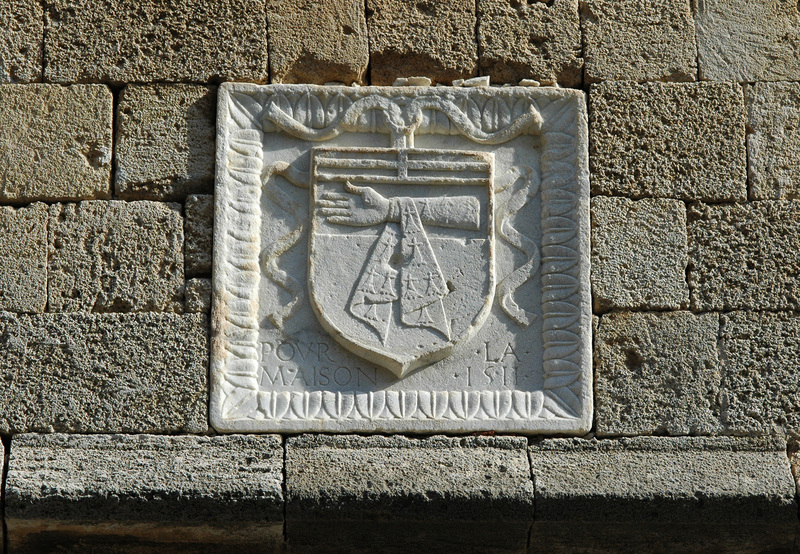 Heraldry carried by the building indicates that its construction can be dated to the years 1365 to 1374. 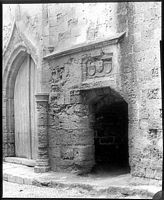 Apparently the property of English Language at the origin, the chapel was probably transferred to the Language of France in the fifteenth century. 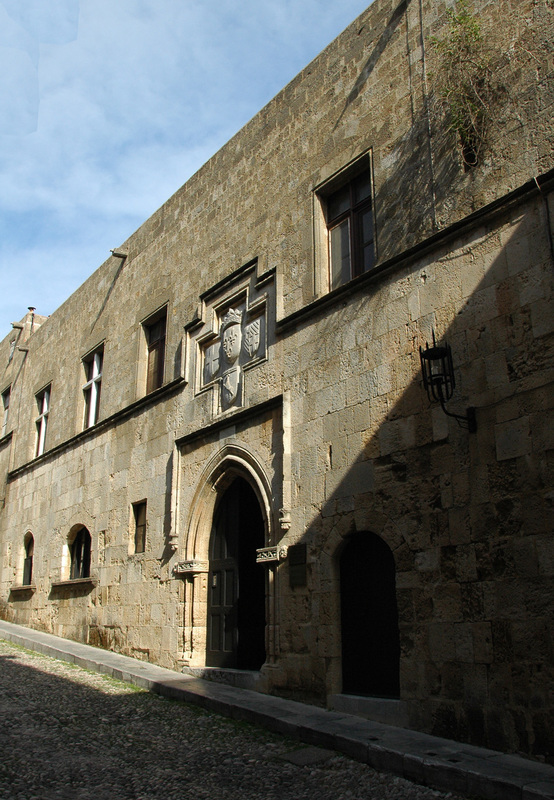 We note then, right amount, the Inn of the Language of Italy, built in 1519 by the Italian Grand Master Fabrizio del Carretto which you can see the shield in the center of the facade, which was restored by the Italians in 1915. Amount on the left, the inn of Spain (Aragon and Castile) is one of the largest hostels. 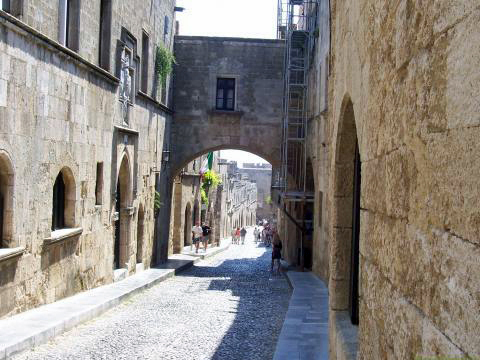 She has a meeting room of 150 sqm. 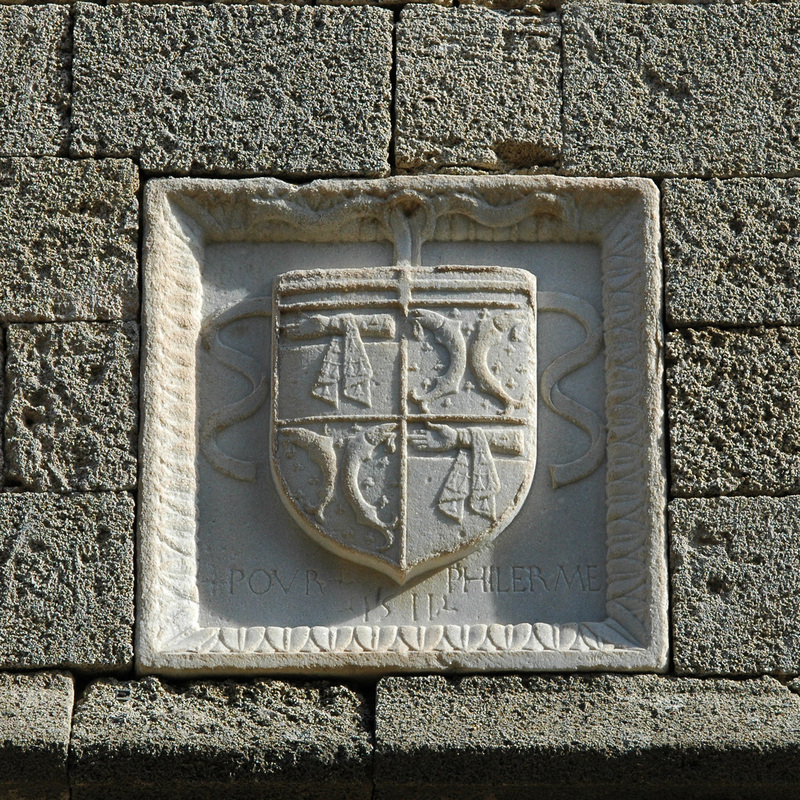 In 1462, the Spanish language is divided into language of Castile and Aragon language. 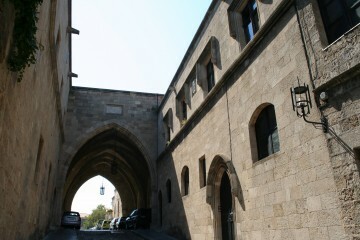 On the right side going up, then rises to the Inn of the Language of Provence , connected by an arch bridge at the Inn of the Language of Spain, on the other side of the street. At the end of a small alley is the Gothic church of Agios Dimitrios built on the foundations of a temple dedicated to Dionysus . 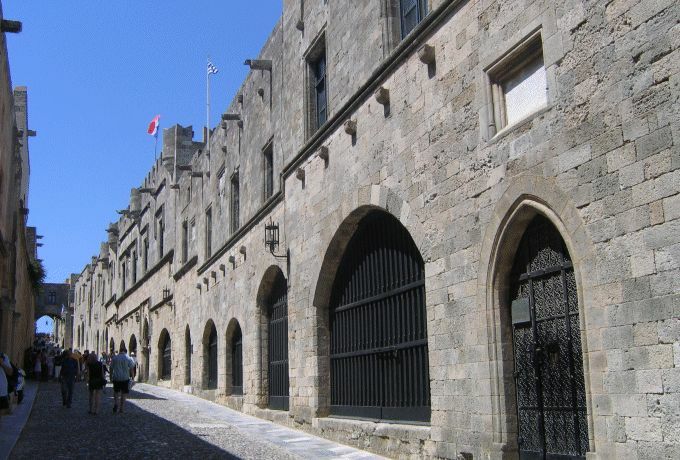 Knights Street ends with St. John the lodge which served as an entrance to Palace of the Grand Masters . 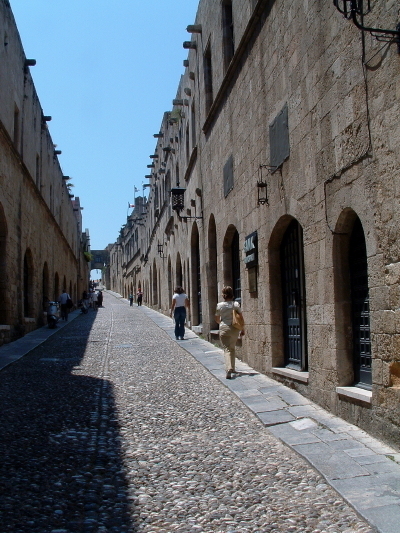 It is located to the left of the square Cleobulus (or Palace Square). 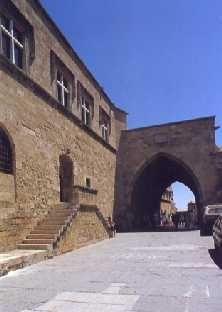 It is an arched entrance warheads two wings, the long side, located in the extension of the street served as a kind of monumental entrance to the Palace of the Grand Masters. This lodge, largely destroyed in the explosion in November 1856 and rebuilt by Italian fascists, had a floor stand, if we judge by the drawings of Flandin and Rottiers ; it was used as a meeting place. The church of St. John, now defunct, was the right of the Palace Square. The Church of St. John was the chapel of the Order were buried where the Grand Masters and where we venerated the hand of Saint-Jean Baptiste Pierre d’Aubusson given by Sultan Bajazet. 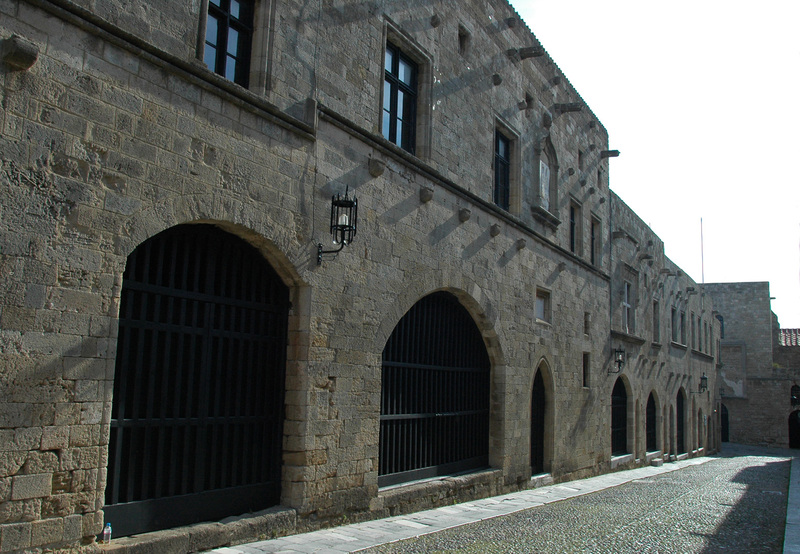 The church was destroyed in 1856 in the explosion of a powder magazine which damaged the Palace of the Grand Masters .